21 January 2015 "1914 Sleepwalking into War"
2015 celebrates the 800th anniversary of the charter from King John to the Norman knight Thomas Fitz Anthony, Seneschal of Leinster, granting Thomas the present-day counties of Waterford and Cork in Ireland. From the time when Thomas Fitz Anthony’s daughter married John Fitz Thomas FitzGerald, their descendants have lived at Dromana house, Villierstown. The FitzGeralds have been an integral part of the community since the thirteenth century. Dromana 800 is a celebration of people and place. There are few families in Ireland today whose history is so well documented. On 3 July there will be a seminar which will include the following distinguished speakers: Julian Walton, Ken Nicholls, Dr Anthony Malcomson, Peter Murray, Robert O’Byrne, Dr. Diarmuid Scully. Other events include music, house tours, Georgian fete, Commemoration of Battle of Affane, genealogy consultations. 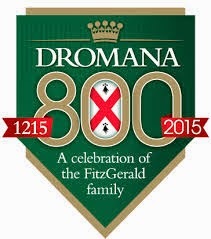 To find out details of the full programme of events consult the web site – www.dromana800.com.